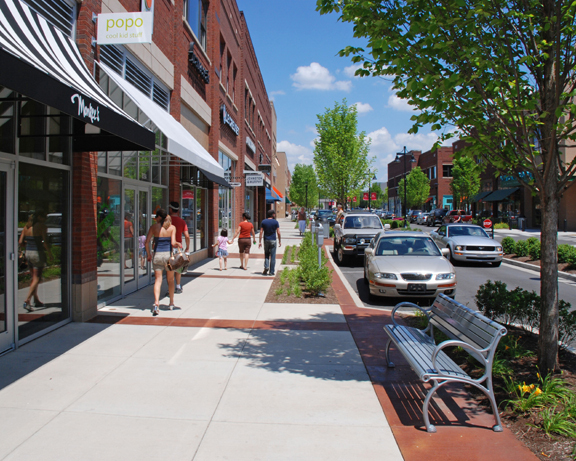 A discussion was started on the ASLA LinkedIn group last week regarding street trees’ impact on retail districts. The discussion centered on Professor Kathleen Wolf’’s research. Professor Wolf is a Research Social Scientist in the University of Washington’s College of Forest Resources Department. She has been at the forefront of the research being conducted in this area. Like the landscape architect who started the conversation, I have also been wondering if anyone has taken her research a step further. Professor Wolf’s research relies on user surveys that include both visual preference surveys and traditional questionnaires that ask respondents to rate environments and/or their willingness to pay more for a product. In an Arborist News article published last year, Dr. Wolf reported on the work she has been doing. In the article, she reports that across all categories, places rated steadily higher with the increased presence of trees. Larger trees rated higher than smaller trees. Her surveys that looked at product pricing within districts with trees indicated that customers are willing to pay 9 percent more in smaller cities and 12 percent more in larger cities. In her response to an emailed question posted on LinkedIn, she explains that she does not suggest that trees are the panacea for other business challenges and that there is not a simple casual link between having trees and increased revenues. Street trees and streetscapes are positive reinforcement of the “atmospherics” that market researchers consider to have influence on consumer’s buying habits. I agree that street trees and streetscapes do add a considerable amount to the ambiance and character of place that people enjoy. Anecdotally, I think most people can understand the impact trees have on how we feel in a space/district. However, since retail success can be very sensitive to location and surrounding demographics, it can be difficult to make a clear connection between retail sales and trees. I hope that research continues to make the case, and like the sophisticated interior research done by market researchers, we can continue to increase our understanding of this relationship. The article in Arborist News also offered some guidelines on street trees in retail districts such as the proper tree species, size, maintenance, and providing signage that contrasts with the trees’ foliage. I would add that tree placement along the street and their relationships to the doors, windows, and dividing walls between businesses are also important to consider. The reports on Professor Wolf’s website Human Dimensions of Urban Forestry and Urban Greening are worth checking out.